The ColorMix card is easy to use for both film and digital images (tif, jpg or raw). Membre d'un forum, d'une asso ou d'un club de photo ? Contactez-nous pour bénéficier de tarifs remisés lors d'achats groupés. The ColorMix card is a reference color tool consisting of 21 colored RVB/CMYK patches and 7 neutral gray scale patches. Each patch is measured with a spectrophotometer and the values are transferred back for L.a.b., Adobe RGB98, sRGB and ProPhoto spaces. Effective in all shooting conditions, the patches of the Colormix card reflect light the same way in all parts of the visible spectrum. Perfectly matte finish, ColorMix facilitates its use and measurement accuracy (no reflection). Each ColorMix is made in a strict standards required of every color and color range is reproduced in a particularly precise. 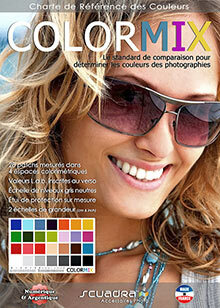 ColorMix can also be used in digital photography, in film or video. It is today a reference chart among the best performing market and can be used by amateur photographers, as experts or professionals. The dimensions of the ColorMix card are 115x180 mm. Composed of a high density polymer with 4 mm thick, it is solid and will easily find its place in your camera bag. • Color values​​: to facilitate the use of the charter ColorMix, each range of color is measured spectrophotometrically. Values ​​are reported back in four color spaces most used in photography: Lab spaces, sRGB and ProPhoto AdobeRGB98. • Scales in inches and centimeters : two scales, one inches the other in centimeters, can have a reference very useful in certain situations Shooting. • Dedicated protection case to conserve ColorMix colored patches over time, each chart is accompanied by a protective case. Particularly thick, it will allow ColorMix to easily find its place in a tote. • Neutral gray scale : the range of 7 colors, from white to black, adjusts the color balance of neutral tones and validate the correct exposure images. For example, light gray indicate a burned-adrenal exposure, black capped under-exposure.